Professor Emeritus of Geology at the University of Massachusetts died unexpectedly on August 23, 2018, after a 6-day bout with pneumonia. The week before he was spending his typical day in the department, interacting with students and faculty, getting ready for an expansion of his most recent book as a layman’s quide to geologic outcrops in the Connecticut Valley and update the second edition of his book on the Department’s history. These are in addition to his 259 page, 2014 autobiography, “Listening to the Rocks: A geologist’s life with Mary Alice,” source of most of the following information. At Penn State, John met Mary Alice Gorman, a graduate of Bucknell University who had wanted to major in archeology but ended up in psychology, got an M.S. in Child Development at Penn State and remained as an instructor. They met at a mixer, were married in 1955, and she became his field assistant in the summer of 1956 as he worked on his Ph.D. thesis on the sedimentology of the Fountain and Lyons Formations in the upturned edge of the Rockies. John describes her in his book as his field companion away from home for 27 field seasons and four sabbatical leaves, raising three children, Ananda (1957), John (1959), and Nancybeth (1965), while keeping the field work going and making it all fun. The growing family went on to John’s position at the Univ. of Missouri from 1958 to 1970 with some summers spent again at the field camp in the Wind River Mountains, others working on the infamous Cow Head Breccia of Newfoundland, and a sabbatical working on sediments in Scotland and Switzerland. 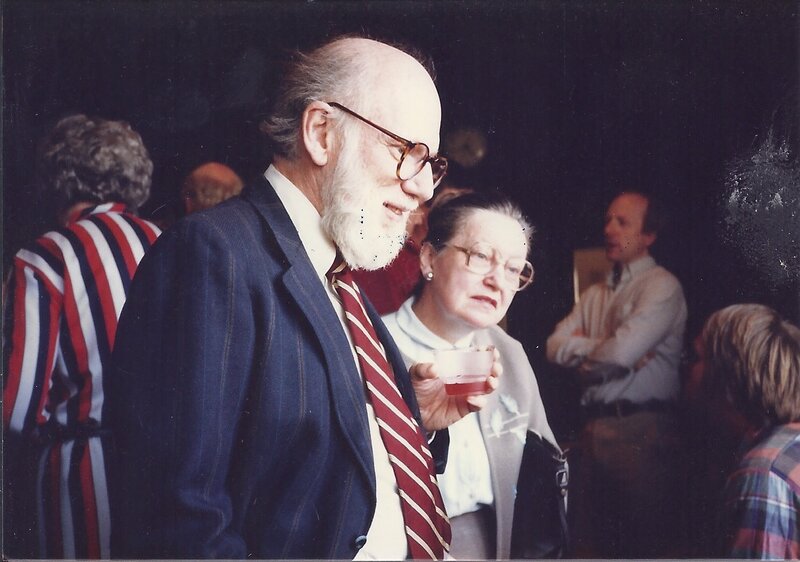 John and the family arrived in Amherst in 1970 for a 35-year stint at UMass where he taught classes in physical geology, sedimentology, sedimentary petrology, geostatistics, geowriting, and seminars. Summers included field work in Nova Scotia, part of a sabbatical in Newfoundland, Univ. of Nevada in Las Vegas, the Utah Geological Survey in Salt Lake City, and Colorado State University in Fort Collins. Over the years he supervised 58 students. His bibliography includes 60 publications. The discovery of Mary Alice’s cancer in 1989 was the beginning of her failing health, difficulty in walking and John’s retirement in 2005 to help care for her until her death in 2012. She is buried in the Gorman family plot in Normont, PA, where John will join her. John will be remembered fondly by a host of individuals: former students, friends, colleagues, co-authors, and geologists scattered throughout the profession and the world, as well as innumerable non-geologists he influenced through his long life, especially his three children. He was a gentle and caring man, of great but unassuming talent, always seeming to be on the cheerful side of issues with a wonderful sense of humor as he followed the one great love of his life accompanied almost all that way by the other.